I remember being impressed my older brother’s Lego building abilities as a kid. His creations were always far superior to my little villages with their trees and houses. I can chalk some of it up to the 7-year age gap, but it’s also because he understood some of the basic building techniques that Lego’s Master Builders use to sculpt their fantastic models. 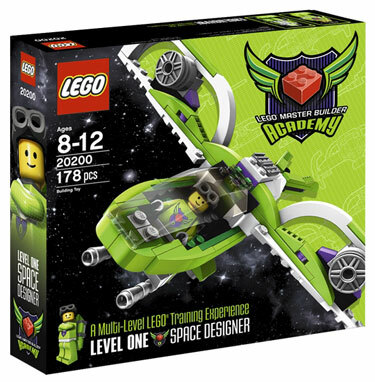 And as of yesterday, with the Level One Lego Master Builder Academy Space Designer kit ($29.99), anyone can start learning the tips and techniques that separate the artists from the assemblers. The kit comes with a Designer Handbook that teaches you how to build three different models. But it’s not just graphics-only assembly directions, as with other Lego building kits. The directions are annotated so your child can understand the techniques that are being used. The Level One Lego Master Builder Academy Space Designer kit stands on its own, but is meant to be the first in a year-long toy subscription. For $69.99, beginning July 1st, you can subscribe to the remaining five kits, which are delivered every other month. The kits are designed to teach successful building methods by showcasing techniques like locking, model stability and sideways building, as well as help your child to conceptualize, design and create on their own models. At the end of the year, LEGO Master Builder Academy subscribers will receive over 1,000 LEGO pieces, six Designer Handbooks, access to exclusive web content and a unique LEGO mini figure for each of the two levels they complete within the year. And it all fits in the Level One Lego Master Builder Academy Space Designer kit box. Neat! There's also a dedicated Lego Master Builder Academy website, where builders will find a series of Master Builder challenges, tips and techniques, videos and rewards, as well as a system to track their progress. I have ordered this set of LEGO kits for my 10-year-old son. I am very much looking forward to seeing how this product turns out and how much he likes it. We are expecting good things from LEGO! It is a wonderful idea from Lego and shows that they care about more than just selling kits of the latest licensed franchise. There are millions of kids who adore Lego and want to make better models and this is such an affirmation for them. We have ordered the kits too and can’t wait to receive them in the mail each month. My son doesn’t excel in traditional school subjects but could spend hours refining a single Lego model. He is very excited and can’t wait to get his first certificate.